Drones should be able to control illegal water abstraction. Photo: Wikimedia Commons. West-Flanders governor Carl Decaluwé in Belgium wants to introduce drones in times of water scarcity. The drones should prevent illegal abstraction of water. During the extreme drought in 2018 many farmers neglected the ban on irrigation and the governor thinks drones could help to locate thiefs. “During the summer only ten farmers were fined, but the infringement took place on a larger scale”, says Decaluwé to motivate his decision in an interview with Focus/WTV. The governor made his statement after the national evaluation of the drought in 2018. The governors of Belgium need to take extra measures to manage the fresh water availability in a water scarce country. 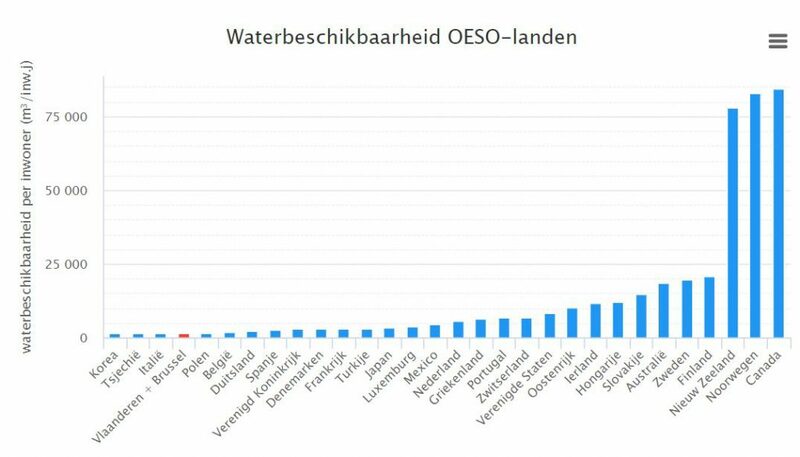 Vlaanderen en Brussels are identified by the Organization for Economic Cooperation and Development (OECD) as water scarce regions. On the OECD-list of water availability (which is not complete, ed.) Vlaanderen en Brussels are on the 4th place, after Korea, the Czech Republic and Italy. The low water availability is caused by a high population rate, economic activities and a lack of big rivers. Water availability in OECD-countries. Source: Het Broodnodige Water. At the end of 2018 Decaluwé said in a report Vlaanderen needs to anticipate on drought. According to the governor Vlaanderen is different from other Belgium regions, like for instance Limburg, because it needs to to prevent intrusion of salt seawater. Fresh water is needed to stop salinization of the fresh water bodies. Decaluwé also pleas for desalination plants and smart water management. One of the measures to enforce the law should be the monitoring of illegal abstraction with drones. Decaluwé wants to sign a framework contract with a drone company to carry out the work. New technology, like satellite images, can also help farmers to irrigate more efficiently. The images can show which parts of the land are the driest and thus need to be watered. Decaluwé expects the drought of 2018 will continue to cause problems for farmers. The groundwater level is still not recovered and it is likely more measures are needed next summer. West-Flanders is known for its production of frozen vegetables. According to research center Inagro it needs high amounts of water for irrigation.